On the last day of the first week of fashion school, our HOD wrote these words on the board: WHY, WHAT, WHO, WHEN, WHERE (and HOW). She pointedly stated that finding the meaning to these words is the key to finding out what we wish to achieve from our chosen field. What started as a simple exercise at the beginning of fashion school became a way of life. For me, at the beginning of a new endeavour or while celebrating a milestone, these five interrogative pronouns come to mind. On 4th October, Fashionopolis celebrated its 2nd blogoversary. While I could have done a regular run of the mill celebration post or giveaway (coming soon), I wanted to share something that has helped me from the beginning of my blogging (and fashion) journey. Every few months I keep asking myself these five questions. The answer to them help me figure out If I am on the right path or do I need to change course. WHY did I want to start a fashion blog? When someone asks me, “Why did you start a fashion blog?” I have my answer at the tip of my tongue. The answer to this is the building block of your blogging journey. After spending years as a fashion designer, I wanted to express my views and love for fashion beyond the designing board. As someone who has studied and worked in the fashion field, plus has a passion for writing, starting a fashion blog was a natural progression into trying out something new but not unfamiliar. WHAT kind of a fashion blogger am I? When I started my blog I knew I wanted it to have an editorial look and feel. My aim was not to showcase my personal fashion or comment about celebrity fashion. I wanted to be a fashion blogger in the literal sense. Someone who wrote about all things fashion. While my blog by large is true to its original format, I have managed to occasionally incorporate my personal style as well as red carpet events. Once you have figured out what kind of fashion blogger you want to be, this will make it easier for you to connect with the right target audience and brands. WHO are my readers and target audience? Before we can answer the brands, we need to be sure of this ourselves. Knowing your readers gives you a good amount of clarity in understanding what works for your blog and what does not. This will also help you connect with the right brands. If you are looking at blogging from a professional angle, your target audience can literally make or break your blog. The reason why Miss Malini or Prez Hilton or Bryan Boy have managed to make it big, is, because they understood their readers really well and gave them just what they wanted. Once you know your audience it becomes very easy for you to select your subject matter and tone of writing. Keep in mind: ‘Who’ must come after ‘What’. First, figure out what kind of a fashion blogger you want to be, then find the right audience for it. Doing it the other way round is not only risky but can backfire. WHEN do I start my fashion blog? Honestly, you can start one tomorrow. I took three months to research the Indian and international fashion blogging market before starting mine. From selecting a name that will convey my blog message to picking the font, layout and deciding on my writing style, I looked at every aspect before I launched Fashionopolis. Since I belong to the fashion field I was well acquainted with the fashion lingo and terminologies. 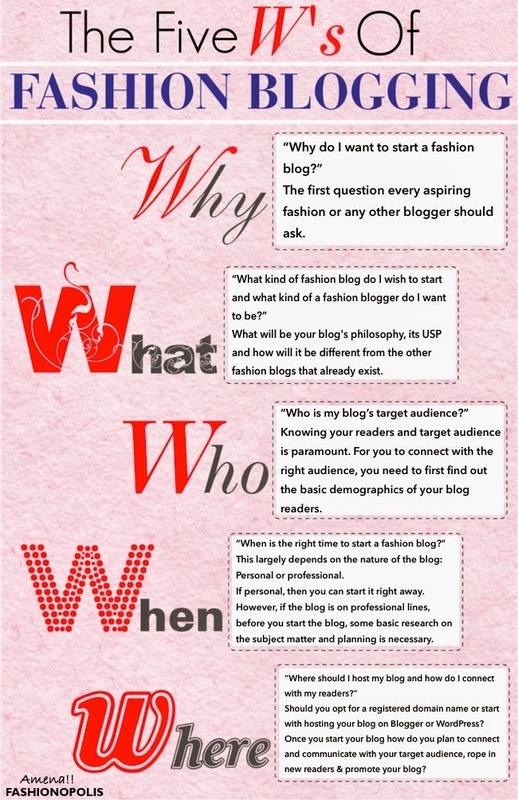 Basic understanding of the subject matter before you start your blog is always very helpful. WHERE do I host my blog & HOW do I reach out to my target audience? Before I started my blog, I looked at both, Blogger and WordPress. Initially, selecting the right blogging platform may seem insignificant, but in the long run it makes a whole lot of difference. The idea of starting a blog is to connect with like-minded people. Be it a personal or professional blog, the aim is to reach out to people. How does one go about reaching out to the right audience? While Facebook helps me promote my blog to a larger audience, Twitter makes it easier for me to connect with my readers and have a one on one equation with them and Pinterest is a great platform to showcase my collages, inspiration and creative. For people to know about your blog you need to spread the word about it. How you do it and which social media platforms you engage in depends on your target audience. Whether you are a newbie fashion blogger or a seasoned one, these five question are a must be asked time and again. Love love love it!!! True to every word! Questioned myself and had all the answers.. Glad I'm on track ;) LOL! Well I couldn't have read this post at a better time.. I had just mentioned on my blog about my lack of motivation towards blogging these days.. Going to have a little 'Five W's' session with myself today. Found your post on the IFB roundup this week. Great questions to think about. I'm especially weak on "who is my audience" at this point. Thanks for reminding me how important this is! Great post dear! Thank you for reminding me of these important points I often tend to forget! You put me to shame! I just woke up one day and started a blog! But yes, over the years, I've given it a lot of thought!